I have found through years of research and numerous intracellular blood tests on patients with macular degeneration and dry eyes that one of the biggest deficiencies they all had in common was Glutathione. Glutathione levels have a direct impact on our overall health and eye health. Glutathinoe is the “Master Antioxidant” found in every cell in the human body. Glutathione is produced in the body from 3 amino acids: cysteine, glutamine and glycine. The key limiting component of glutathione production is a specific form of cysteine that is relatively rare in the correct form in the typical American diet. When glutathione levels are deficient the body can not protect the cells against free radical damage, oxidation and disease. Low levels of Glutathione result in Rapid aging, compromised immune system and chronic illness. New science indicates that close to 100 diseases may be related to a deficiency in this Master Antioxidant. Research also indicates that decreased levels of glutathione may increase the risk of glaucoma, macular degeneration,cataracts and dry eyes. Glutathione was one of the most common deficiencies found in spectracell intracellular blood testing on patients that had both macular degeneration and dry eyes at The Lange Eye institute. Glutathione levels are highest when we are young and healthy and lowest when we are old and sickly. As we age our risk for a compromised immune system and and chronic illness increases as our Glutathione levels drop. Toxins in our environment, food and water we consume daily also negatively impact these levels. Glutathione is the bodies natural detoxifier that is crucial for promoting healthy DNA and mitochondrial functioning. ATP and energy production are directly influenced by glutathione levels. Low Glutathione level symptoms are: tired, lack of energy depression, dry eyes, joint pain, dry skin, poor sleep, brain fog, dizzy spells, weakness, skin rashes and frequently sick. Maintaining optimal levels of Glutathione is essential for over all wellness and well-being of the entire body and eyes. Low levels of this potent anti oxidant may cause compromised immune system and chronic disease can flourish. All health care providers should address this potential problem through properly educating the patient on life style modifications and dietary changes however realistically many will not follow these recommendations and fall back into their toxic lifestyles sedimentary lifestyles. I have found one of the best ways to stimulate Glutathione levels is by consuming a non denatured (cold processed) whey protein concentrate from grass-fed cows 1-2 times a day. Non denatured whey protein concentrate contains the Tri peptide of amino acids necessary for production of Glutathione. The correct form of cysteine (not cystine) along with glutamine and glycine is necessary for this conversion. It is important to use a whey protein concentrate (WPC) not a whey protein isolate (WPI). The whey protein concentrate has higher levels of immune building cofactors and is less processed than the whey protein isolate. This whey protein concentrate must come from cows that are free range grass fed all year round and not feed lot cows fed GMO grains! The cow’s milk must be free of pesticide, hormones and antibiotics. I have been impressed with whey protein concentrate derived from the milk of New Zealand A2 cows. A2 cows are quite rare and have not gone through any genetic mutations over the last few 1000 years, each cows DNA is checked to make sure they are an A2 cow. It is very difficult to find a non denatured whey protein concentrate from New Zealand grass-fed A2 cows for a reasonable price with 20 grams of protein. 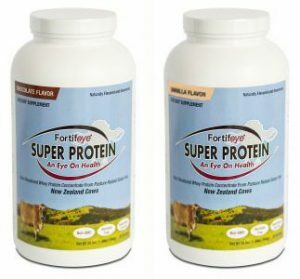 Since it is next to impossible to find this type of protein that meets all of this criteria locally, I decided to develop Fortifeye Super Protein. Fortifeye Super protein is non gmo, non denatured, cold filtered, and is free of corn, soy, gluten, antibiotics, hormones, pesticide and sugar. Fortifeye Super Protein is great for people on a low carb diet since there is only 2 carbs. This whey protein concentrate is sourced form the highest quality free range grass fed New Zealand A2 cows. If you want kick-start your immune system and give the fuel your body needs to promote overall wellness then consider the extremely pure and bio active Fortifeye Super Protein.